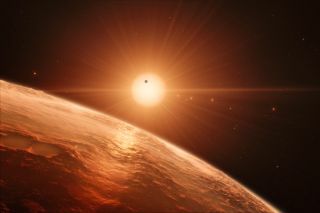 An artist's illustration of the view from one of the seven planets orbiting the red dwarf TRAPPIST-1, with several other worlds visible closer to the small, dim star. The seven rocky planets circling the nearby star TRAPPIST-1 have lots of water, a new study suggests — perhaps too much to make them good bets for life. All of the TRAPPIST-1 worlds likely harbor hundreds of Earth oceans' worth of water on their surfaces, and the wettest ones may have over 1,000 times more of the stuff than our planet does, according to the study. "Too much water can be a bad thing," lead author Cayman Unterborn, a postdoctoral fellow in the School of Earth and Space Exploration at Arizona State University, told Space.com. "The TRAPPIST-1s are interesting, but maybe not for life." TRAPPIST-1 is a dim red dwarf star that lies about 39 light-years from Earth. Astronomers discovered three planets circling the star in 2016, and four more were announced a year later. Each of the seven worlds — which are known as TRAPPIST-1b, c, d, e, f, g and h — is about the same size as Earth. And three of the alien worlds (e, f and g) are thought to lie in TRAPPIST-1's "habitable zone" — that just-right range of distances where liquid water could likely exist on a planet's surface. TRAPPIST-1 is about 2,000 times dimmer than the sun, so the red dwarf's habitable zone is very close-in. Indeed, all seven TRAPPIST-1 planets lie closer to their star than Mercury does to the sun. This diagram shows illustrations of the seven TRAPPIST-1 planets and compares some of their key characteristics with those of the rocky planets in our own solar system. This modeling work suggested that there's a wetness gradient in the TRAPPIST-1 system. The innermost planets, b and c, are probably about 10 percent water by mass, whereas the wet stuff makes up at least 50 percent of the more distant f and g. The middle planets d and e fall somewhere in between. All of these worlds are sopping wet, even at the low end of the gradient. For comparison, Earth is just 0.2 percent water by mass. Indeed, the TRAPPIST-1 planets are probably "water worlds," with no land to break the monotony of wind and wave, Unterborn said. If that is indeed the case, the odds of finding life in the system may not be great. "With no exposed land, key geochemical cycles including the drawdown of carbon and phosphorus into oceanic reservoirs from continental weathering will be muted, thus limiting the size of the biosphere," the researchers wrote in the new study, which was published online today (March 19) in the journal Nature Astronomy. "As such, although these planets may be habitable in the classical definition of the presence of surface water, any biosignature observed from this system may not be fully distinguishable from abiotic, purely geochemical sources." And all that water might shut down some key geological processes that could help life get a foothold, Unterborn said. For example, rocks in Earth's mantle often become liquid after moving upward to a zone of lower pressure, where their melting point is lower. But such "decompression melting" may occur rarely, if at all, on the TRAPPIST-1 worlds, because the huge weight of the overlying global oceans jacks up mantle pressures so much. Planets orbiting red dwarfs face other habitability challenges, many researchers have stressed. For example, if these worlds orbit tightly enough to be in the habitable zone, they're almost certainly "tidally locked," meaning they always show the same face to their parent star. So, one side of such planets may be boiling hot while the other is frigid. This problem could be mitigated by the presence of a thick atmosphere, which would circulate heat. But red dwarfs fire off lots of powerful flares, which may quickly strip away the atmospheres of habitable-zone worlds. Such issues are heavily debated and studied, which isn't surprising given the prevalence of red dwarfs: About 75 percent of the Milky Way's stars are red dwarfs, so they likely harbor most of the galaxy's real estate, habitable or otherwise. Overall, the study indicates that red dwarf systems such as TRAPPIST-1 shouldn't be thought of as just miniature versions of our own solar system, Unterborn said; their planets may form in slightly different ways, and/or on slightly different timescales. "Understanding it from a planetary formation and evolution perspective, I think, is — for the public especially — a much more powerful way of selling TRAPPIST-1 than life," he said. "No one likes being the wet blanket who says, 'Well, actually, they're not that great for life.' But they're really interesting, and we need to know these things in order to understand the planets that are likely to have life."